Airs Thursday, September 28, 2017, at 7 p.m. Music and Liturgy for Yom Kipur, (The Day of Atonement) Sung by The Western Wind with Guest Cantors, Narrated by Leonard Nimoy. The Western Wind Vocal Ensemble explore the rich and profound musical and spiritual traditions of the Jewish High Holy Days. 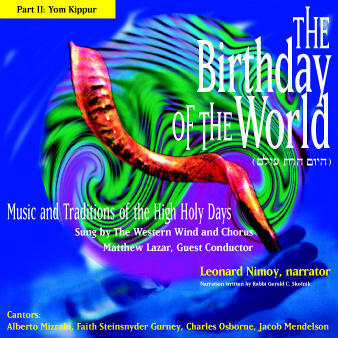 The Birthday of the World presents some of the most inspiring music of the Jewish Liturgy performed by The Western Wind, guest singers and four internationally renowned cantors. Musical selections include Avinu Malkeinu, Kol Nidre, El Maleh Rachamim, traditional chant and composed works by Sulzer, Secunda and Nowakowsky. A narration performed by actor Leonard Nimoy elucidates the important prayers and illuminates the deeper structure of the liturgy.